Sometimes, you have to have real food. No matter how creative you get with the stove and treasure hunts to the store, there comes a time when you have to have real meat. And it has to be grilled. 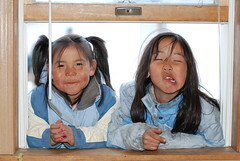 We are very lucky because we have a big tough Eskimo friend with grill. He likes to bring it over to our house and cook for us. There are two difficulties when barbecuing in the snow: braving the cold outside long enough for the meat to cook and keeping the meat hot as it travels into the house. Our tough Eskimo friend takes care of the first difficulty. He can stand outside forever as long as he is equipped with the above grilling necessities. 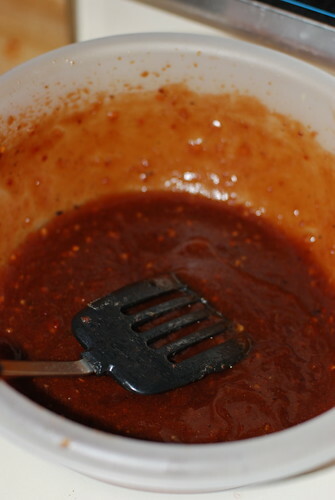 This is the barbecue sauce that BTE used to marinate the ribs. It is made of bottled barbecue sauce, lots of garlic, and probably some other stuff (sorry for the vague details, I was busy doing important stuff on my laptop while he was concocting it). He soaked the ribs in Sierra Mist as a tenderizer before marinating them in this sauce. 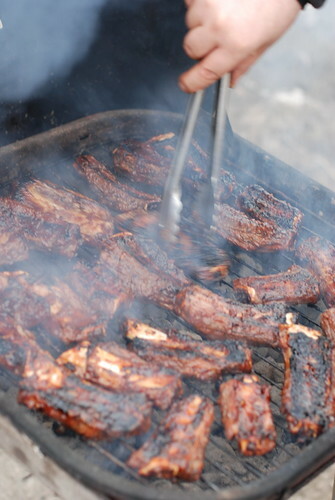 These are the ribs cooking. I'm salivating just remembering them. The soda pop tenderizer really did the trick. They were so easy to chew and yummy!!! I practically transformed into a feral animal gnawing the meat off the bones as fast as possible. 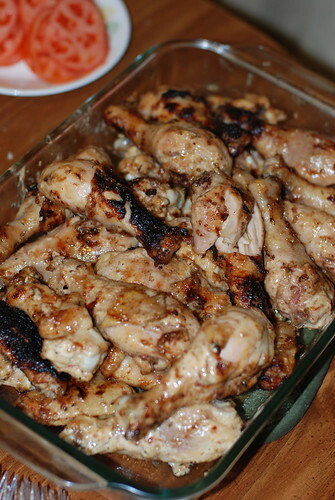 This is the chicken marinade. 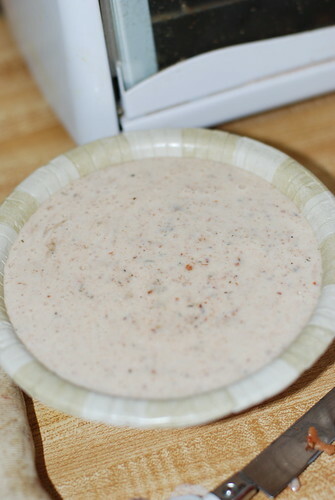 BTE made it by mixing ranch dressing, lots of garlic, bacon bits, and Sierra Mist. I'm not always a huge ranch dressing fan, but this stuff smelled a-freaking-mazing. I wanted to eat the marinade all by itself. Only my fear of salmonella from eating it with a soup spoon. The chicken was major yum too. Steve came close to falling in love with it. That's funny because he usually thinks that chicken is a sissy food. He said it was Rodizio's good (Rodizio's is our favorite Brazilian grill in Salt Lake City. It's like an Alston family law that we have eat there every time we're in Utah). My contribution to these dinners usally consists of running the meat back and forth to BTE and other mundane tasks like slicing pickles and asking Steve to set the table as soon as he finishes the next level of Mario World. 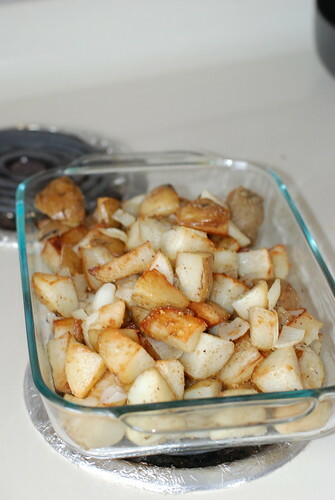 In honor of Steve's birthday, I tried this home fry recipe from my favorite cooking blog: Amateur Gourmet. I started by boiling the potatoes. When they were soft enough that my weak wrists could stab a knife through them, I took them out and cut them into chunks. 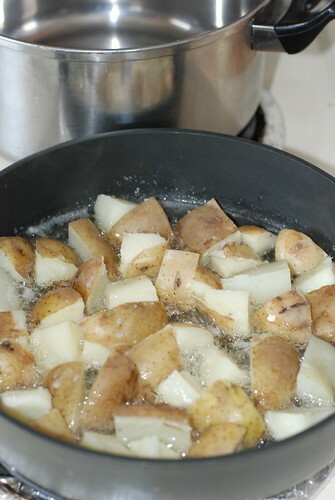 Then I fried them on one side with in oil and butter. After slightly browned, I flipped the chunks and added minced onion and an assortment of seasonings. The finished potatoes were a huge hit. Everyone at the birthday party (BTE, BTE's oldest daughters, our coworker Coleenie, and our new friend visiting from the Netherlands) devoured them completely. This recipe instantly made its way into our list of favorites. Our Arctic Barbecues break up the monotony of my crock pot and/or frying pan delicacies. I would encourage all readers to barbecue even if the obstacles include freezing temperatures and high meat prices. It's worth it. *No members of the Alaska Alston family actually have any type of firearms in their possession.